After its Guest of Honor appearance last year, Finland saw more international interest in its books, especially from China. 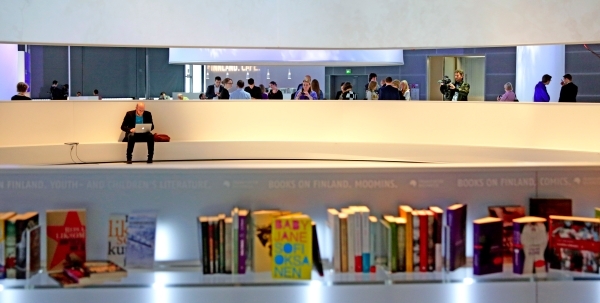 Finland was the Guest of Honor at the 2014 Frankfurt Book Fair with the slogan Finnland. Cool. Following that hugely successful project, which was coordinated by FILI – Finnish Literature Exchange, there has been more interest from around the world in Finnish literature than ever before. We are now focusing on meeting that demand, maintaining the momentum and developing new projects and working models. The aim of Finland’s Frankfurt project was to achieve a lasting increase in sales of translation rights for Finnish literature abroad. There was a steady rise in the numbers of rights sold in the run-up to the 2014 Frankfurt Book Fair, and sales have remained at a respectable level since then. In the cautious market for books in translation, that’s a real result. The success of the Finnland. Cool. project attracted interest from other quarters as well — especially our neighboring countries. Norway is aiming to be Guest of Honor at Frankfurt in 2019. In the planning stage of the Finnland. Cool. project, we regarded the German book market as the springboard to the rest of the world, and that’s how things have turned out: publishers and literary agents have reported growth in the anglophone world and in Asia, particularly China. Those regions continue to be the focus of our efforts. We’re now setting our sights on the English-language literary market. Meanwhile, interest from China has centered on Finnish children’s books. We had a very successful time at the Beijing International Book Fair this autumn, and the Shanghai Children’s Book Fair is coming up in November. The preparatory phase of the Finnland. Cool. project included some international “Editors’ Week” events, where we hosted groups of editors from many countries in Helsinki. We plan to continue with this successful model: three such group visits are already planned for 2016. For “small” languages like Finnish and Finland-Swedish, we have to remember that we can’t just promote sales. Training translators is also part of our core activity: we need a constant supply of professional translators for many languages. FILI organizes professional development seminars for practicing translators and is working with partners to launch mentoring programs for beginning and emerging translators. In China, we are teaming up with the other Nordic countries to solve the translator shortage we all share there. Rights are being sold to China, and there is plenty of work on offer. Literary translation is a specialized sub-field within translation itself, and it requires specialized training. The Guest of Honor project provided a lot of fun and benefits here in Finland, too. Finnish publishers and literary agencies experienced a surge of activity. There was a phenomenal sense of cooperation and team spirit among publishers at the Frankfurt Book Fair last October, which will certainly continue to benefit our domestic publishing industry in the future. The wide-ranging program of events throughout Germany was very rewarding and generated new ideas about the culture of reading. Our authors were flattered by the audiences who had paid to come to so many “Lesung” reading events — those sorts of paid events weren’t that common in Finland before, but more and more are starting to pop up here as well. Literature itself – the foundation of all these activities – is in excellent health in Finland. Many of our authors who have achieved success abroad published new works this autumn to favorable reviews. We’re delighted with all the debut authors who bring intriguing new insights and have already found their own voices. Finnish literature – including crime fiction and thrillers, children’s books, non-fiction and graphic works – seems to have something to say across all its genres. We’re going to keep working hard to help it reach wider audiences. FILI will be at the Finnish publishers’ collective stand (5.0 A87) at the 2015 Frankfurt Book Fair from Wednesday to Sunday.